Earn 269 SATVantage Rewards points with this purchase! The AZBox Elite HD is an FTA satellite receiver supporting up to two tuners with a display resolution of up to 1080p. The unit allows you to connect an external hard disk in order to work as a fully featured PVR. The AzBox Elite HD is not just a satellite receiver but a complete media centre where you can easily playback any Video and Audio files such as XviD, MPEG2/4 and MKV files from your attached hard disk or directly off a shared folder on your network! AZBox HD is also a Media Player with full functionality for media of our modern days. Music, photos and video are easily played and accessed with our models. Allowing you to play your favourite songs, watch your holiday photos and movies. You can also play many advanced and high quality formats of audio and video. AZBox Elite HD is equipped with two CI slots (Common Interface) as well as one card reader that provides a wide range of decoding options. This means AZBox HD is optimally prepared for any future developments in encryption standards. On AZBox HD you will not lose any critical scene of your favourite show, if you need to leave the room. Just activate the Time Shift function, the reproduction is paused and later you can resume it from that exact moment onward. You can also choose to record the show for later viewing, which can be done by pressing a button, or by scheduling the recording. With AZBox HD you have time on your hands. AZBox HD has a File Browser totally compatible  with your local or remote files, so you are able to copy, cut and paste them. You are able to browse files not only on local drive or external drives connected using its USB hosting feature, but you can also experience high level of convenience with its supports for wire/wireless networks, connecting to your PC. AZBox HD models include an integrated Web Browser that allows you to surf the Internet on your TV, using only your remote control. You can store your favourite sites in a favorites` list, adding any site to that list is just a click away. Increase your web experience with AZBox HD. 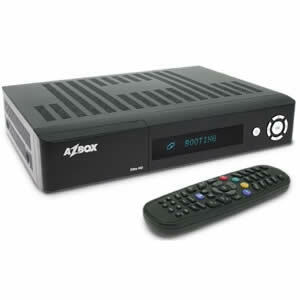 With AZBox HD, it is possible to watch YouTube videos on your TV, in a very easy way. You do not need to use a browser, just set your preferences in the categories` menu, and you are ready to enjoy the wonders of YouTube. Discover the features implemented on our YouTube Player. Search and organize videos by country, genre, etc. In AZBox HD YouTube Player you can watch the videos in full screen for a better experience. AZBox Elite HD is equipped with a wide range of connectors: 2 USB connectors (one on the front side, another on the rear side), that allow users to connect portable media or external USB HDD, to use USB like internal HDD for PVR / Time Shift and media center functions.